There’s no doubt about it, the human body is both weird and wonderful and our Allied Health students get to learn every day about its quirks. 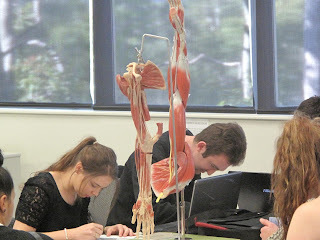 Specifically they are now beginning to get an even greater insight into human anatomy, thanks to the use of plastinated body parts within our anatomy courses. For those who have never heard of Plastination, it is a chemical technique developed by Germany’s Gunther von Hagens, made famous by his Body Worlds exhibitions. The technique preserves bodies, or body parts (yes actual human body parts from people who have donated their bodies to science), so that they can be safely used for educational purposes. 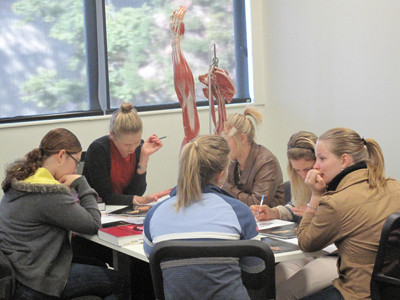 CQUniversity is one of the first Australian universities to introduce plastinates. The intricate detail preserved within each plastinate makes them perfect for tertiary level programs, and so there was little hesitation when it was proposed that this ingenious teaching tool should be introduced into our class rooms. Coming from a health background myself, I cannot stress enough the value of learning about the human body from a human body. What’s more the use of these plastinates is a great way to help familiarise students with the human body in way that is much less confronting than the use of cadavers. The use of such realistic teaching practices is a direction I am proud that CQUniversity is taking. Along with plastinates our School of Medical and Applied Sciences have also introduced displays cast from original bone, from the Bone Clones® Human Adult Skeleton Series and our School of Nursing and Midwifery has gained National and International recognition for the Mask-Ed (KRS Simulation) pioneered by our very own Professor Kerry Reid-Searl. This ‘real-world’ approach is not only preparing our students for clinical practice but is preparing them for their careers. 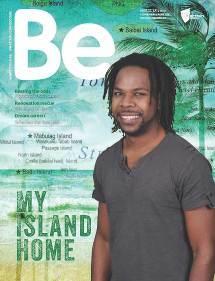 Click here to see a video about plastinates at CQUni.